With warmer weather comes the unwanted pests and bugs that linger around your home. Wouldn’t it be nice to be able to enjoy the warm weather in White Bear Lake, MN that is right around the corner without having to worry about seeing bugs crawl across your floor? Well, by partnering with Eco Tech, you can achieve pest free living this spring! By teaming up with our exterminating technicians, your home will be treated with products that are not harmful to your children or pets, while still being able to get rid of these pests for good! Although these critters are small, they can still be dangerous and may carry disease, so don’t risk it. By choosing Eco Tech, you not only receive over 50 years of combined pest control experience, but you get to also partner with a local company that has a true passion for serving the White Bear Lake community. When dealing with bugs our local background goes a long way because of our expert knowledge of the common pests in this area and how to properly treat them. There is no need for annual fees with our staff. To top it off, our extermination services are covered with a four year warranty. Eco Tech makes it so there is no excuse left, so call our professionals today! 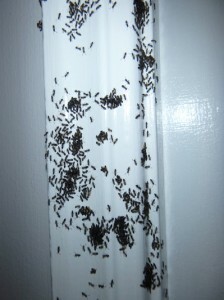 Initiate the Call – The minute you find these pests around your home, give our experienced team a call. Inspect – Once you make the call, one of our professionals will come to your home and inspect the in’s and out’s of your residence to find the pests, including their nests. Exterminate – Using our all natural products, our staff will perform the extermination process to get rid of these bugs once and for all. Repair – Let us be your one stop shop for anything regarding pests. If any damage to your home is found during the inspection process, our team can handle the repairs as well. No need to hire another contractor, let us take care of the damage for you. Prevent – Although exterminating is great, you run the risk of these pests returning if preventative measures are not taken. We perform preventative steps to ensure these critters do not return in the future. So, if you live in White Bear Lake, MN and have noticed a pest problem around your home, give Eco Tech a call today at (763) 785-1414. Let our extermination team get rid of these bugs so that you can enjoy the upcoming warm weather in peace!